A virtual Network is essentially an IPv4 subnet used for physical and logical segmentation of network traffic between virtual servers. In the upper right corner is a button labeled Show All, which can be used to display all networks, including networks that are not associated with the current working virtual data center. More information about virtual networks and their connection to the physical network can be found in a separate chapter about networking. Name - Unique network identifier (usually used in the API). Alias - User-defined name of a network (usually displayed in the GUI). Public - Network is usable by all users in this virtual data center. Private - Network is usable by SuperAdmins and owners of this network. Deleted - Network is hidden and unusable for new servers, but can be still used by some already defined servers. DC-bound? - Whether a network is bound to a specific virtual data center. Subnet - IPv4 network prefix and subnet mask. VLAN - 802.1Q virtual LAN ID (0 = none). NIC Tag - NIC tag configured on a compute node. VXLAN - VXLAN ID required for overlay NIC tags (1 - 16777215). Free IPs - The current amount of usable free IP addresses (read-only). 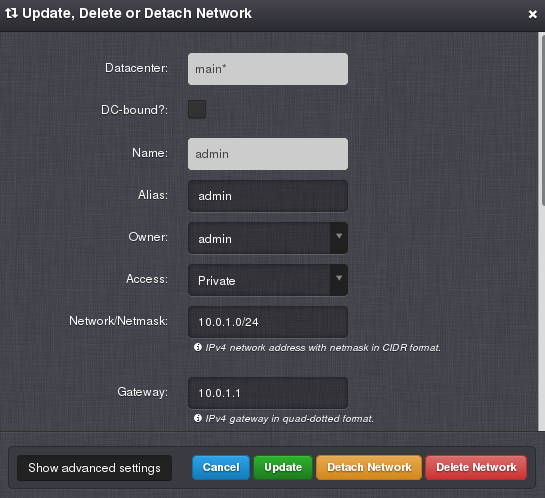 A network can be created, updated and deleted by a SuperAdmin or by a NetworkAdmin (DC-bound network only). A network used by at least one virtual machine cannot be deleted. However, its Access attribute can be changed to Deleted, thus the network will be hidden and unusable for new virtual servers. A virtual network is connected to the physical network interfaces on compute nodes via NIC tags. NIC tags must be configured on every compute node in advance. Resolvers - Comma-separated list of IPv4 addresses that can be used as DNS resolvers by virtual servers using this network. PTR domain - Existing in-addr.arpa domain name used for creating PTR associations with virtual servers. DHCP passthrough - When true, IP addresses for this network are managed by an external DHCP service. 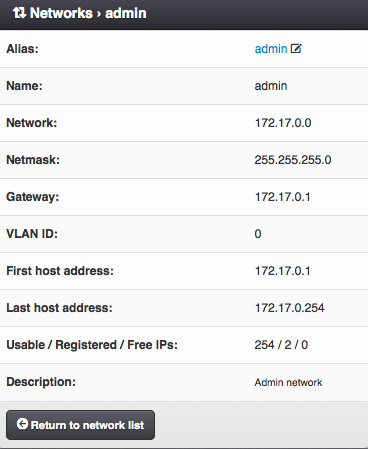 It is still possible to add IP addresses via Danube Cloud to this network. However, IP address conflicts may occur while doing so. Used for associating an existing network with a virtual data center. Can be performed only by a SuperAdmin. A virtual network can be only used when attached to a virtual data center. In order to remove an association of a network with a virtual data center, the network must not be used by any virtual machine within the virtual data center. Can be performed only by a SuperAdmin. 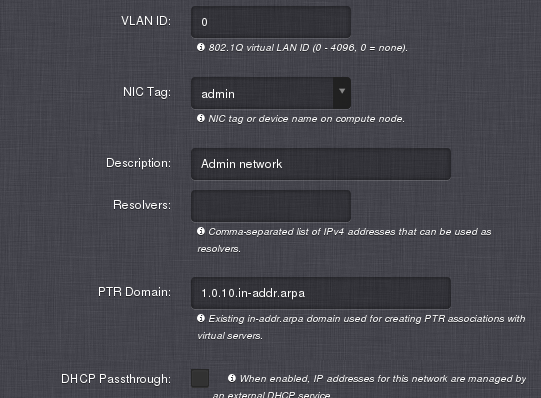 Other - IP address is reserved for other purposes in this network (e.g. HW router, IP printer, etc.). Server - Virtual server that is using this IP address (read-only). Hostname - Hostname of a virtual server or compute node that is using this IP address (read-only). MAC address - MAC address of virtual server’s NIC that is using this IP address (read-only). Before a network can be used by virtual machines, IP addresses have to be added to the network. 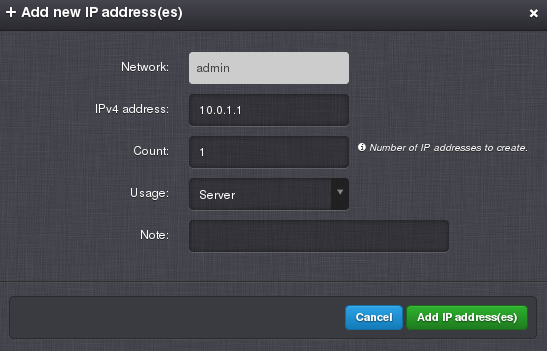 IP addresses can be added, updated or deleted by a SuperAdmin or by a NetworkAdmin.